Shop local. Eat local. Drink local. Be local. The Good Jobs™ is now a proud member of Local First Milwaukee! 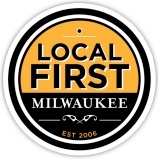 Local First Milwaukee is a network of businesses with roots in the Milwaukee area. Locally produced products and services maintain the city economically, financially, and culturally. We care about our city and what it has to offer us. That is why we want to give back to the community by challenging consumers to shop, eat, drink, and purchase from local businesses. Become a patron of your city. ← Recruiting and Marketing, and the Gray Space Between.